This lure This lure works great to move and position a bull while bugling and while stand hunting. Super attraction to those rutting bulls. Formulated with internal glands and pure "in-season" cow elk estrus urine. Our elk lures also work well as a cover scent.works great to move and position a bull while bugling and while stand hunting. Super attraction to those rutting bulls. Formulated with internal glands and pure "in-season" cow elk estrus urine. Our elk lures also work well as a cover scent. This lure This lure works great to move and position a bull while bugling and while stand hunting. Super attraction to those rutting bulls. Formulated with internal glands and pure "in-season" cow elk estrus urine. Our elk lures also work well as a cover scent.works great to move and position a bull while bugling and while stand hunting. Super attraction to those rutting bulls. Formulated with internal glands and pure "in-season" cow elk estrus urine. Our elk lures also work well as a cover scent. Works very well as an early season lure for bulls as well as being very attractive to the cows. This formula lures in bulls and also lures and has a "calming effect" on the cows. Contains internal glands and non-estrus cow elk urine. Elk lures also work well as a cover scent. Works very well as an early season lure for bulls as well as being very attractive to the cows. This formula lures in bulls and also lures and has a "calming effect" on the cows. Contains internal glands and non-estrus cow elk urine. Elk lures also work well as a cover scent. Brings 'em out of the bush. Works well while grunting bulls during the rut or while stand hunting moose trails. Try treating a "rut pit" with our Moose/Heat Lure. Contains cow moose "in-season" estrus urine taken from mature cow moose and internal glands. Brings 'em out of the bush. Works well while grunting bulls during the rut or while stand hunting moose trails. Try treating a "rut pit" with our Moose/Heat Lure. 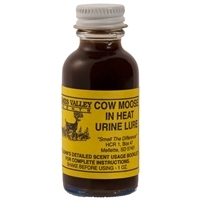 Contains cow moose "in-season" estrus urine taken from mature cow moose and internal glands.